Before my time on Earth, I lived on another planet. Ours is a peaceful, beautiful place where the landscapes are pastel clouds and the buildings made of pure crystal. Our technology so advanced, that it works with nature. Our people haven’t known war in many millennia, and experience only pure joy. Each of us has wings in place of your ears, and skin that changes color to reflect our levels of joy. 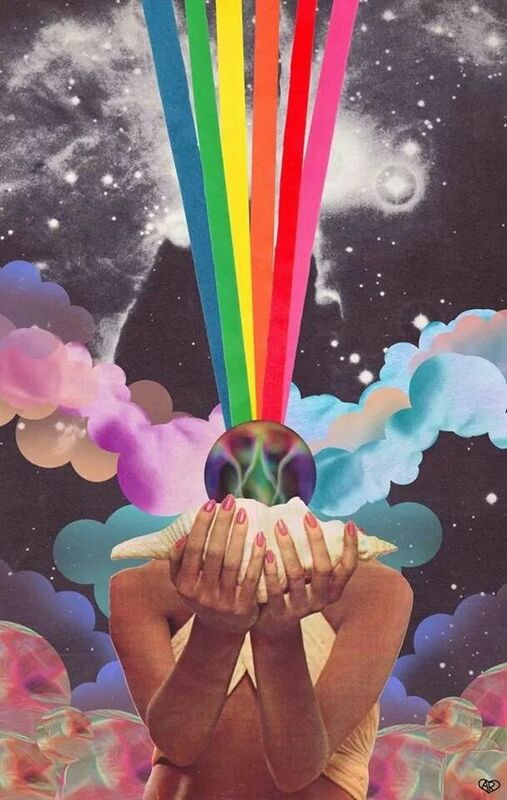 I always felt different, for I experienced a broader range of emotion and dreamt of colors that didn’t yet exist. I longed to explore distant places. One day as a child at school, I learned of a planet in peril called Earth, who was being abused by her children. It seemed her Earthers hadn’t learned from their past mistakes and were given another chance to correct them; Earth’s current trajectory held devastating repercussions throughout the entire Universe. I fell instantly in Love and knew it was my mission to do my part to help save her. I learned of The Starseed Mission, an intergalactic program of Light beings from all Soul Families spanning the Universe, who travel to share their unique gifts and services with planets and dimensions in need of guidance. There were three conditions to my acceptance: 1) I would have to cut my wings and 2) suppress my rainbow skin colors, as all visitors are required to disguise their true identity when visiting Earth. 3) I would temporarily forget who I was and where I came from, only able to connect with home through my imagination. Luckily, each is equipped with a Mission Activation Switch that turns on at various points throughout a journey, to remind a Starseed of their mission and true origins. I arrived to Earth in 1980 and had chosen two perfectly suited parents for my mission: a beautiful humanitarian mother named Karyn, and my father James, a walking encyclopedia with bottle green eyes. My first few years I could remember exactly who I was, however my attempts to communicate this only resulted in frustrated infant cries. My first communications were with animals, flowers, trees, faeries and spirits. I spoke with them often and it was foretold that I when I grew up, I would become their Ambassador to the human realm, and be a voice for the powerless. As a young child I developed a deep interest in the metaphysical, stars, twins, rainbows and magic. I was a bright light and full of energy that overwhelmed most. A series of experiences and interactions would temporarily suppress my colorful personality and dim my light, as I did my best to conform and play by Earth’s rules. I moved to NY on my own at 17, and for a time, the societal programming worked. I became disconnected, and like them, unable to remember my origins and deep connection to nature. I began using toxic foods and substances to suppress the pain of separation from a world I could no longer remember. I worked in the bizarre world of fashion, but mainly pursued good times as a club kid. I now see that each step was a challenge to overcome in preparation for my ultimate truth, brilliantly designed by my Higher Self. My Starseed activation occurred at 18 when I met Hayley Starr, my Highest Self, on a meditation retreat. Memories began to return, and at the age of 20, I moved to Los Angeles in search of a healthier life. This was a prolific time, as I began incorporating these ancient visions into my art and clothing designs. I traveled deep through many esoteric rabbit holes and created numerous lines and collections. I have since created art, clothing, children’s books, jewelry, and wellness products all intended to activate memory in their users. I opened and closed two collaborative installation spaces- one devoted to art (The Divine Quest of Hayley Starr and Co.- West Hollywood/ 2004-2009) and the other to healing and consciousness expansion (The Quest- Venice CA/ 2014-2017); with the intention of exposing my now vast social circles to the truth of our origins. My second and latest activation began in January of 2017 while on a trip to Tulum, Mexico. I returned home to LA inspired. Having adopted the theory of flow, I decided to dissolve my multiple business in order to make room for what I felt was coming next. In September of the same year, on a 17-hour drive home from Burning Man, I began to receive the download for a new healing modality I would later call Calibration Codes. We are currently working on the system, protocol and database to help reveal your most efficient path to enlightenment. Calibration Codes launches Fall of 2018. This site is the upload of my own personal journey and advice (blog), creations (shop) and the inspiring healers and teachers(healers) and products that I love (suggested). It is also my joy to make you smile through social media (connect). Everything here is intended to activate you. It is no mistake that you have been led here, search within this site’s content for a special message(s). There is a Native American prophecy that foretells of a time when the animals and the lands will be ravaged, and a tribe of beings of all colors, creeds, and classes who by their actions and deeds, shall restore balance making Earth green again. They will be known as the Rainbow Warriors. We are The Rainbow Warriors! We are lucky to be alive at this incredible moment on Earth. Many applied to be here, but only relatively few were chosen. You and I are here on a divine mission, and we sometimes forget because amnesia is one of the rules here, and those who created the game would prefer that you did. There is something you have to contribute that nobody else here can. There is now an official urgency that we can no longer put off as we run out of Earth-time and the portal to change is quickly closing! Luckily, many are here to help re-mind you, and Calibration Codes will help you find them. Do not let the rainbows fool you! We are gathering... and this is a Revolution!